Aizawl, Jun 19 : Authorities on Thursday said repatriation of Brus from Khakchangpara relief camp in North Tripura district scheduled to begin from next Monday would be cancelled as no Bru came forward for identification even on the last verification day. Deputy commissioner of Mizoram-Tripura border Mamit district Vanlalngaihsaka told PTI that no one had turned up at the verification office at the relief camp since Monday. Vanlalngaihsaka said that people claiming to be representatives of the relief camp submitted a list of demands entitled 'voice of the people' which was in verbatim the contents of the demands submitted at the Kaskau relief camp on June 4 last. Verification of bona fide residents of Mizoram was conducted at the Kaskau camp from June 2-4 during which no one turned up for identification. He said that he forwarded the memorandum to the state home department. The demands of the Brus lodged in the six relief camps in Tripura included increase of rehabilitation package per family from Rs 85,000 to Rs 1.5 lakh. 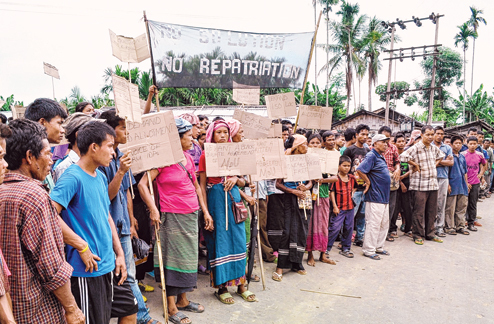 Though the Supreme Court instructed the Centre and the state governments of Mizoram to repatriate all the Brus within six months, not a single Bru has been repatriated till date. As per the road map for repatriation prepared by the state government and approved by the apex court, the repatriation process commenced from July 2 and is scheduled to be completed by September 4. State Additional Secretary for Home Lalbiakzama said that despite initial hiccups the repatriation process would continue as per arrangements made in the road map.